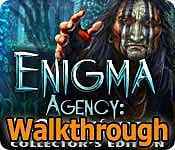 This is the official guide for Enigma Agency: The Case of Shadows Collector's Edition. Select 'Play' (A) to begin your adventure. Select' Options' (B) to adjust sound, custom cursor, difficulty level, and screen size. Select 'Bonus' (C) to play your bonus chapter. 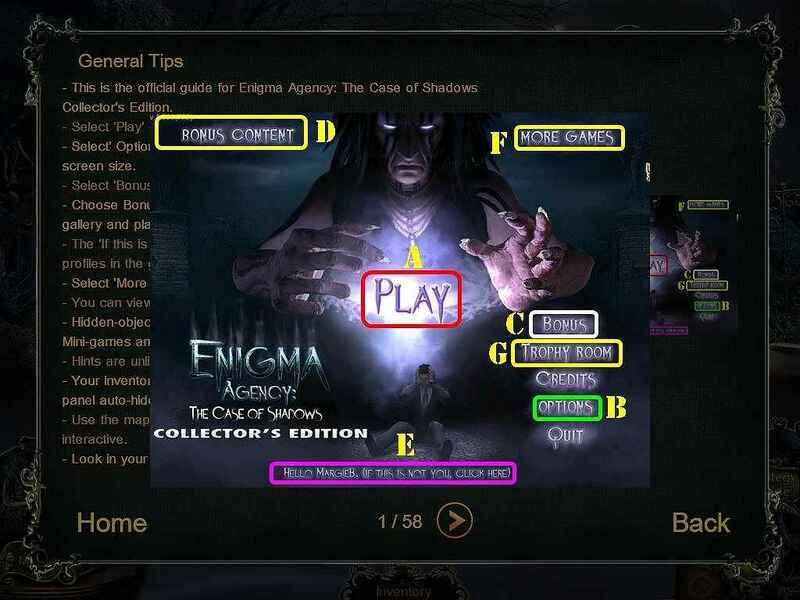 Choose Bonus Content (D) to replay puzzles, hidden objects, view a gallery and play some tracks. The 'If this is not you, click here'' button (E) can be used to manage your profiles in the game. Select 'More Games' (F) to view other titles from this developer. You can view your trophies here (G). Hidden-object puzzles will be referred to as HOPs throughout the guide. Mini-games and HOPs are sometimes randomized; your solution may vary. Hints are unlimited, but you must wait for the meter to refill. Your inventory is located in the lower panel; select an item to use it. The panel auto-hides; move your mouse down to bring it up. Use the map located in the lower right to view all locations. The map is not interactive. Look in your diary to read the adventure's events and clues.